The explosion that created the Crab Nebula was described by Yang Wei-te, the court astronomer (astrologer) to the Chinese Sung emperor, and may be the basis of two petroglyphs found in the US southwest. We now see the Crab as it appeared 945 years after the supernova. Its name derives from the resemblance of the optical nebula to a claw of a crab. Neutron stars are extremely dense, with a mass slightly greater than the Sun compressed into a sphere only 20 km across. The strong gravity of the star packs the neutrons in its core more tightly than neutrons are packed in the nucleus of an atom. Every 33 milliseconds the neutron star in the Crab spins one full revolution. This means that a point on the equator of the neutron star travels at roughly 4 million miles per hour. The star was spun up when it collapsed from a normal, large and relatively slowly rotating, star down to the compact size of the neutron star. The effect is the same as when a twirling ice skater pulls in her arms and spins faster. 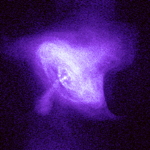 The neutron star's rapid rotation (30 times/second) powers the radiation we see from the Crab pulsar and the nebula. The neutron star has a strong magnetic field, 10 trillion times as strong as the magnetic field of the Earth. Because the star is rotating, the magnetic field acts like a gigantic electric power generator. The Crab neutron star produces a total power output equal to 100,000 times the power output by the Sun. Generating this power gradually slows down the pulsar; the period of rotation of the Crab pulsar is increasing by 15 microseconds per year. This stellar dynamo also produces a wind of electrons and positrons, the anti-matter partner of the electrons. The positrons are created in the intense electrical fields of the generator at a rate of 10^37 positrons per second. The electrons and positrons flow out from the Crab at close to the speed of light and energies up to at least one trillion electron volts. There are approximately 1000 known pulsars and the number increases almost daily. Most are discovered by radio observations. The Crab is one of the youngest and most energetic pulsars known. A few dozen pulsars are also seen to pulse in X-rays and six are seen to pulse in gamma-rays. The Crab has been seen to pulse in almost every wavelength, in radio, optical, X-rays, and gamma-rays. The nebula is also visible over this broad range of wavelengths.